“When I got my first ‘real’ job, I remember my father telling me to make sure to set aside some money each month to invest in my retirement. ‘And don’t forget to diversify!’ he added. It took me awhile to figure out how to use the company’s retirement program to set aside a few dollars each month in an investment account. And it took even longer to learn what the term ‘diversify’ meant, but I finally understand it – mostly.” ~ Sarah Dewees of First Nations, the author of this article. Many people, young and old, experience the same confusion when first encountering the world of investing. It sometimes seems that the terms and concepts are designed to perplex and intimidate people. First Nations Development Institute set out to make investing easier by designing a workbook called Investing for the Future. 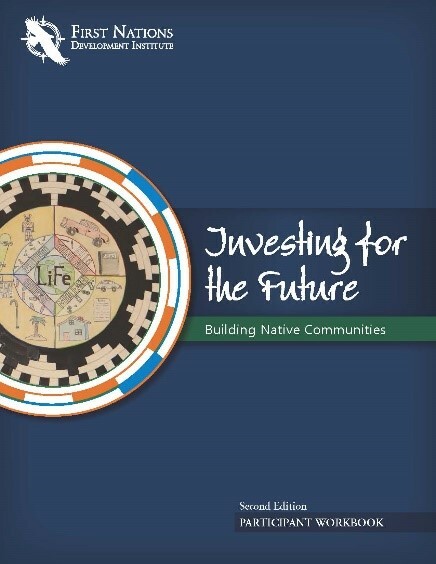 As part of the Building Native Communities series of financial workbooks, Investing for the Future provides an overview of basic investing concepts and provides a three-step process of designing your own basic investment portfolio. And you will learn how to diversify along the way. In August 2018, First Nations will be releasing the fully revised 2nd edition of the Investing for the Future workbook. We have also scheduled a train-the-trainer workshop that will be held October 16-17, 2018, at Northern Quest hotel and resort in Airway Heights, Washington. The workshop is a great opportunity for financial educators, CDFI staff and other financial professionals to learn more about how to teach investment concepts. For more information, visit http://www.bncweb.org/bnc-iff. To register for the workshop, visit http://www.cvent.com/d/vgqgr1.